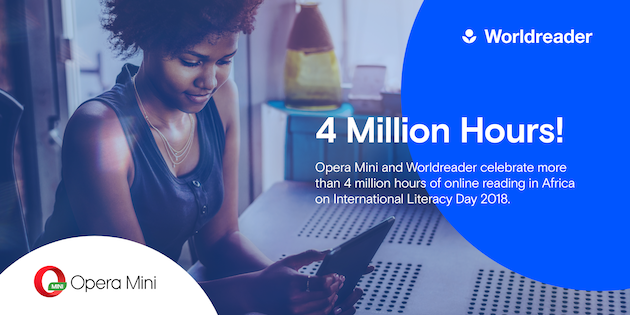 Opera and Worldreader, the global nonprofit that believes everyone can be a reader, announce on International Literacy Day that African mobile users have spent more than 4 millions hours of reading books on their mobile phones in 2018. This milestone represents an increase of 32 percent from the same time period last year. 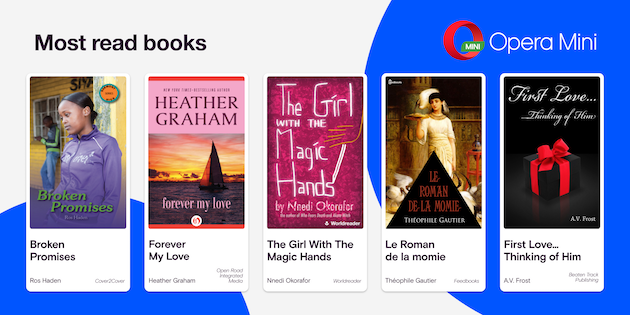 The partnership between Opera and Worldreader started in 2015 with the aim of bringing free e-books to millions of mobile users in Africa through Opera Mini, the leading mobile browser in data compression. The technology behind Opera Mini compresses text and images to 10 percent of their original size, reducing data consumption and the cost of data on a mobile phone and allowing users to spend more time reading and downloading their favorite books when using Worldreader. According to the latest report of Groupe Spéciale Mobile Association (GSMA), “The Mobile Economy Sub-Saharan Africa 2018”, at the end of last year there were more than 444 million unique mobile subscribers and 250 million smartphone users. These numbers represent a big opportunity to bring reading to millions in the sub-Saharan region through technology. A study conducted by Worldreader, called Reading in the Mobile Era, showed that 65 percent of mobile readers in Africa are men while 35 percent are women. However, women tend to spend 11.5 minutes reading on average while men read 6.5 minutes per session, making women more frequent readers. Moreover, African mobile readers prefer books related to love and romance, especially those that come from local authors and publishers. Below you can find a list of the most read books in Worldreader and Opera Mini in 2018. Opera Mini is available for iOS and Android on App Store and Google Play store.